This is a story about returning to a place that you thought you had left forever. 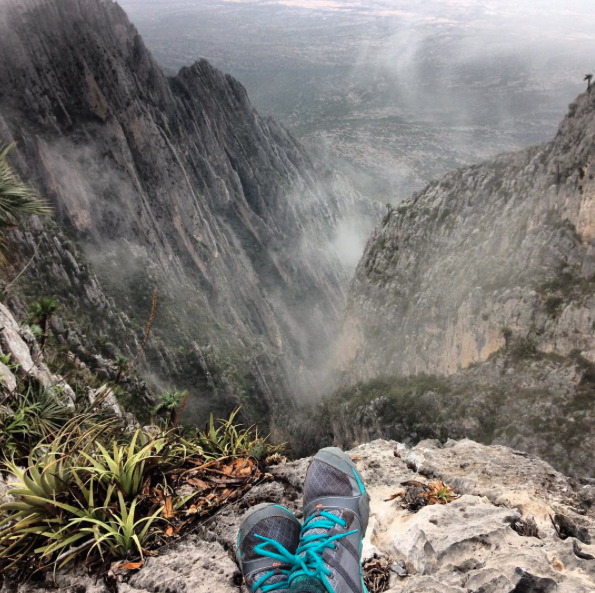 It’s about embracing the right here, right now, and playing on your edge. It’s about what happens when you get rooted and invested in your community to create a life you love. For me, this a story about becoming a true Townie – a story that certainly resonates with my own. 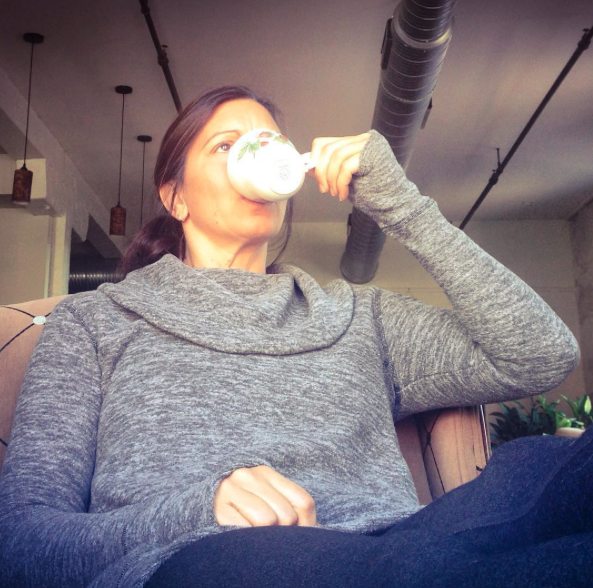 I first met Deanna Dzybon of Rock Water Yoga online. We came across one another by way of instagram and her mission immediately spoke to me. I often gravitate towards people that stand for something greater than themselves – online and off. Her mission of making yoga accessible and affordable, building a conscious community, and supporting local businesses shows that she certainly does just that. A month or so after connecting online, I found myself nervously standing on top of a shaky ladder with camera in hand photographing sixty colorful folks in downward-facing dog. I was working on a story for Winston-Salem Monthly magazine featuring her work and trying my best to play it cool. I didn’t want my tense posture to distract from the meditative vibe. 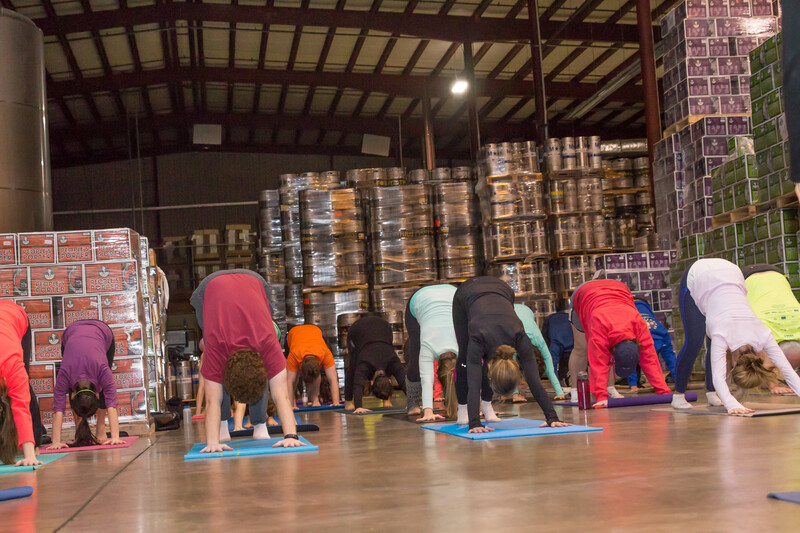 Below me, on the other hand, was Deanna in her element leading her weekly Yoga(mmunity) class at Foothills Tasting Room. She later tells me that she may seem calm but she is often overwhelmed with gratitude when she stands in front of all of those people who continue to show up to support her. 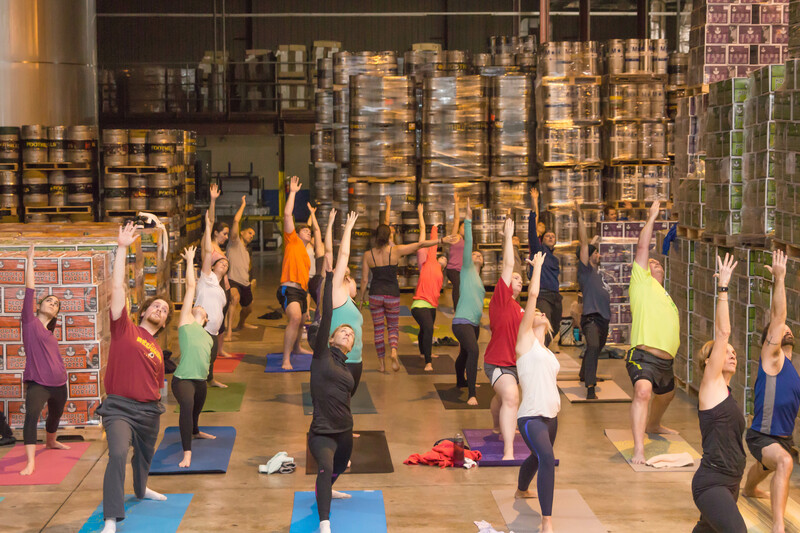 Yoga(mmunity) at Foothills Tasting Room happens every Saturday at 11am. 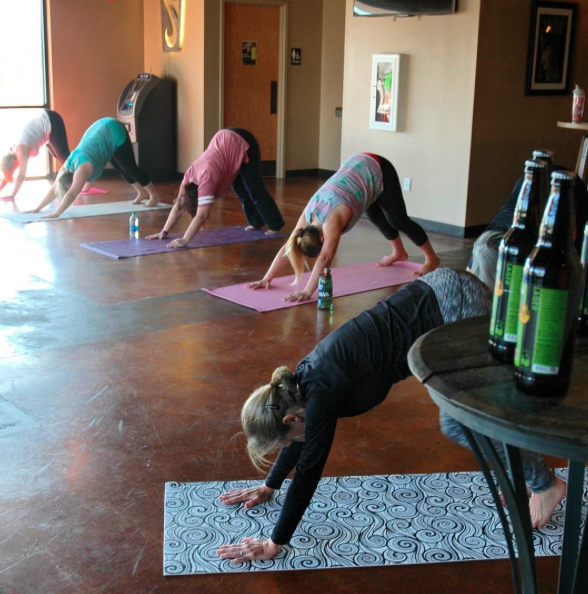 For a modest five dollars you can enjoy a 60-minute all levels yoga class followed up with a freshly poured pint of one of Foothills 20+ locally brewed craft beers. 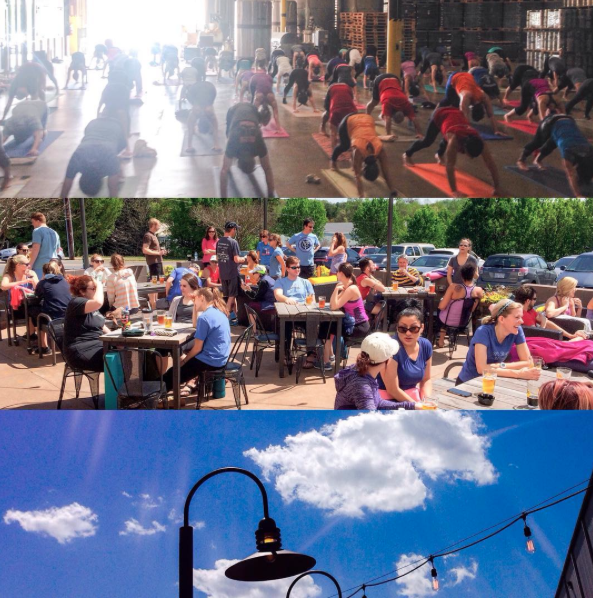 “Call it a yoga class with a free pint or a pint with a free class, either way it’s a deal,” she says. Many participants make an afternoon out of it. It’s a way to connect with friends and family, get a workout in, and start your weekend off on a relaxing note. 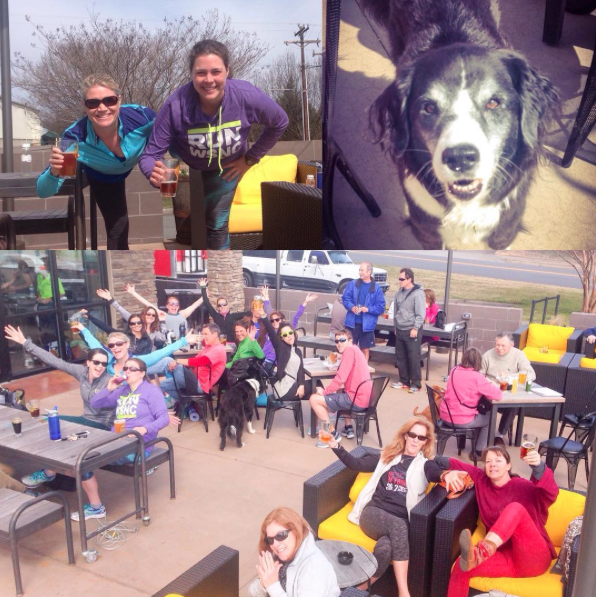 “I’ve had running groups change their schedules so they can come to class after their runs and then enjoy a post-workout beer together”, she says. 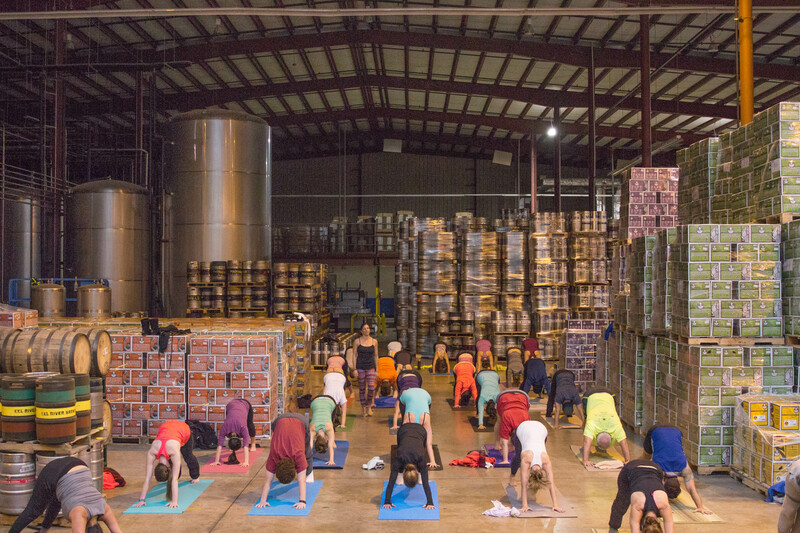 Yoga(mmunity) has also helped boost the tasting room’s weekend sales. The success of this original class led to more offerings. Deanna has since started a Community Fit class which she also hosts at Foothills Tasting Room every Tuesday at 6:30p. This class, also five dollars with a pint of beer, includes 30-minutes of heart-pumping, bodyweight high-intensity interval training outdoors. 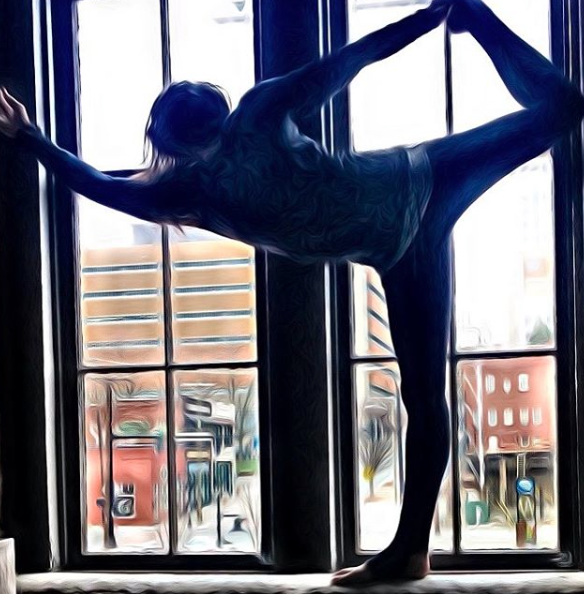 Demand for her Yoga(mmunity) class has also allowed her to connect with and support other area businesses including Corners Coffee in Advance, Pig Pounder Brewery in Greensboro, the recently opened, Bull City Ciderworks in Lexington and the soon-to-be-opened Wise Man Brewing in downtown Winston Salem. This year she hopes to continue to expand her classes and partnerships with local businesses and special events, and has aligned with other local instructors to make it possible. She is also collaborating with Yoga In Your Park which brings yoga to stunning outdoor spaces and encourages support of local, state, and national parks. She’s focused, she’s passionate, and she’s generous with her time. Most importantly she’s learned to let go of expectations and start each day with an open mind and a grateful heart. Later at Twin City Hive we talked over pour-overs about what it feels like when life takes you in an unexpected direction. We have both experienced this personally. Take a leap. Play on your edge. A number of years ago she left her life as a social worker in Winston-Salem to follow an opportunity that suited her soul. 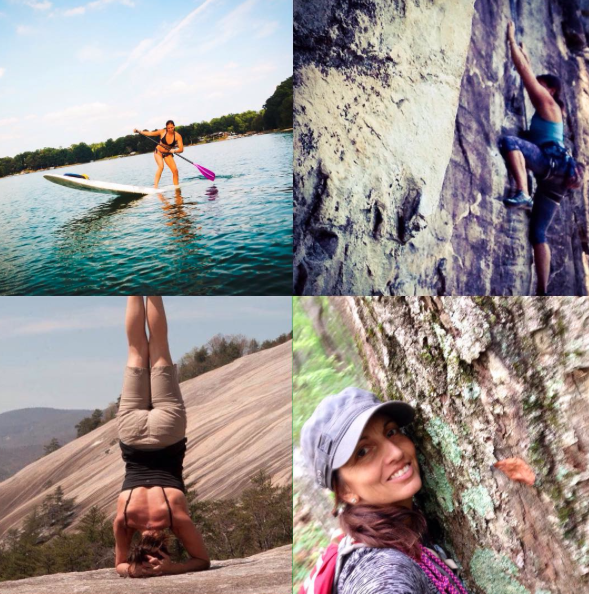 She found herself living outside of Asheville working as a seasonal instructor for the Nantahala Outdoor Center – a place that National Geographic Adventure has called “one of the best outfitters on Earth.” The energy there, connecting with nature and a like-minded community, pushing people past their limits to build their confidence – it energized her and she loved it all. Yes, she had left a stable position and a steady government paycheck for seasonal work, but it felt right and it was an adventure. She traveled in her off seasons. She studied yoga and meditation in Thailand and became a certified instructor. She surfed the world-renowned waves of Bali and Sri Lanka and taught yoga on the shore. 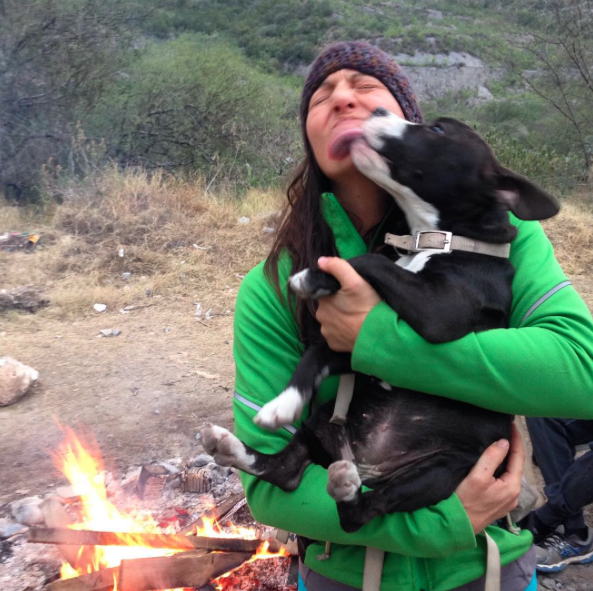 She went rock climbing in three international countries, she re-started her dog sitting business, she continued to study integrative nutrition and eventually became a Integrative Nutrition Holistic Health Coach. And with that, she never intended to grow her yoga business in Winston-Salem. But one day she started to shift and as she slowly let go of her hard fast plans, new doors kept opening up right where she thought she would never return. 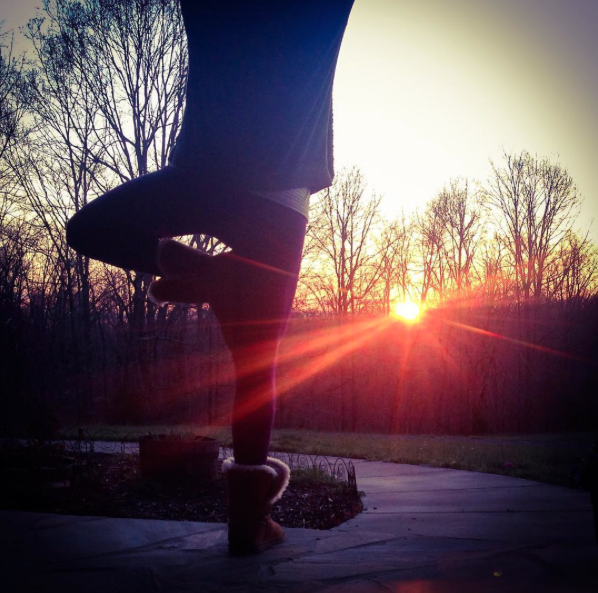 With that, she is working to bring yoga into Forsyth County public schools and will be teaching yoga, wellness and mindfulness to UNC- School of Arts Summer Intensive Dance Program students through her new position as that program’s Wellness Coordinator. She is also helping to grow local businesses in a real, tangible way. 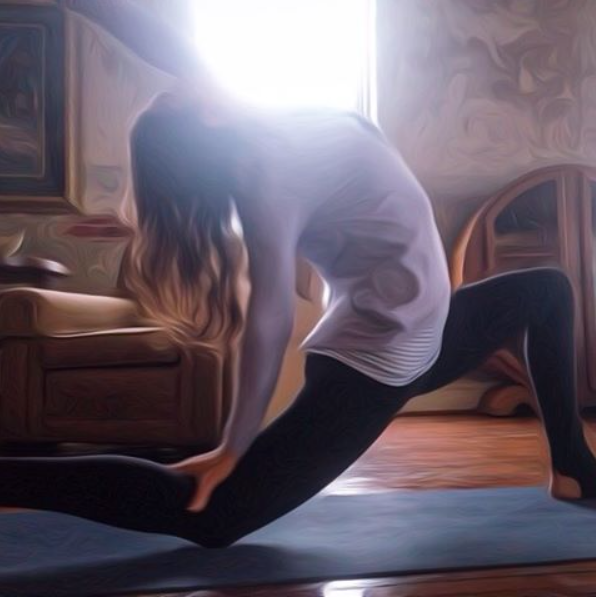 More than yoga. Building a Conscious Community. She is also very clear on what community building means to her. Her story is a reminder that the things we love most can lead us to our best selves. It shows that you can begin anywhere again if you let go of the past. It is a lesson that it’s not where we’re from or where we’ve been that matters. What matters most is what we are doing right now to make a difference in the community where we currently live. And to me – this is what it means to be a Townie. And I am so very grateful that Deanna is now a part of our Winston-Salem Townies tribe. To learn more about Deanna and see a current class schedule, click here. You should definitely come! It’s truly a no-judgment zone!!!! This was one of the best articles I’ve read in a long time, anywhere. Thank you so much, I cannot wait to come visit Deanna. So much of this and her (and your!) story resonates with me as well, and I almost become overwhelmed with… well an emotion that I just don’t have a word for? Thank you!! Enjoy the day!